'Ciliopathies' are an emerging class of genetic multisystemic human disorders that are caused by a multitude of largely unrelated genes that affect ciliary structure/function. They are unified by shared clinical features, such as mental retardation, cystic kidney, retinal defects and polydactyly, and by the common localization of the protein products of these genes at or near the primary cilium of cells. With the realization that many previously disparate conditions are a part of this spectrum of disorders, there has been tremendous interest in the function of cilia in developmental signaling and homeostasis. Ciliopathies are mostly inherited as simple recessive traits, but phenotypic expressivity is under the control of numerous genetic modifiers, putting these conditions at the interface of simple and complex genetics. In this review, we discuss the ever-expanding ciliopathy field, which has three interrelated goals: developing a comprehensive understanding of genes mutated in the ciliopathies and required for ciliogenesis; understanding how the encoded proteins work together in complexes and networks to modulate activity and structure-function relationships; and uncovering signaling pathways and modifier relationships. Motile cilia (flagella) arose in the eukaryotic lineage in single-celled protists, where they took on signaling capacities, and it was only with the emergence of the multicellular animal kingdom that their non-motile cousins (primary cilia) appeared. Motile cilia in multi-ciliated organisms beat in coordinated waves and are found in various tissues, where they perform a variety of functions. For example, motile cilia in the trachea function in sweeping mucus and particulates out of the lungs and in the fallopian tubes they assist in moving the ovum from the fallopian tube to the uterus. Primary cilia, on the other hand, have a role in sensory detection. In worms, for example, they are present exclusively in a handful of neurons used to detect food. Although there are some cells with motile and primary cilia in vertebrates, most cells have primary cilia whereas only a handful of cells have motile cilia. Both types of cilia have a protruding microtubule structure called the axoneme emerging from a basal body that contains the pair of centrioles (Figure 1). Structurally, the axonemes in both motile and primary cilia comprise nine doublet microtubules, but primary cilia differ in that they lack the two central microtubules (9 + 0) that motile cilia have (9 + 2). Schematic of a primary (non-motile) cilium and intraflagellar transport (IFT). (a) Ciliary cargo proteins, transported from the Golgi network to the basal body, move between the base and the tip of the cilium by IFT. Motor proteins, such as kinesin 2 and dynein 2, associated with IFT complexes, are responsible for movement along axonemal microtubules in an anterograde and retrograde direction, respectively. (b) Schematic diagram of axoneme cross-section. Motile cilia have a 9 + 2 microtubule pair ultrastructure, with inner and outer dynein arms, whereas primary cilia typically have 9 + 0 arrangement, without dynein arms. Cilia maintain separate cytoplasmic and membrane compartments, but are completely lacking vesicles. Instead cilia rely on specialized modes of transportation called intraflagellar transport (IFT) to deliver cargo proteins and lipids along the axoneme. IFT can operate in the anterograde direction (towards the ciliary tip) using complex B factors, or in the retrograde direction (towards the ciliary base) using complex A factors; together these factors regulate the transport speed and net cargo flux. An important, recently emerged aspect of cilia is the gatekeeper role of the septin family of proteins, regulating initial entry and exit of ciliary factors at the base of the cilium . The transition zone, where the gatekeeper functions, is an adjacent structure at the base of the cilium, forming the linkers between microtubule and ciliary membrane; it is probably required for unloading ciliary-directed cargo and sorting ciliary-based signaling mechanisms  so that the cell can interpret their context. Although ciliopathies are individually rare disorders, an amazing spectrum of what were previously disparate syndromes is now recognized as part of the ciliopathy spectrum. Ciliopathies can be subdivided into 'motile ciliopathies' and 'non-motile ciliopathies', although we usually define ciliopathies as disorders that result from aplasia and/or disrupted function of primary cilia. Motile ciliopathies comprise a class of disorders displaying prominent situs inversus (a condition in which the normal positions of organs are reversed). Non-motile ciliopathies show prominent but mixed features in several vital organs, including the brain, kidney and liver, and others, such as the eye and digit. Ciliopathies range from largely organ-specific disorders, such as polycystic kidney disease (PKD), to pleiotropic disorders, such as cerebello-oculo-renal syndrome (CORS), Bardet-Biedl syndrome (BBS), Jeune asphyxiating thoracic dystrophy (JATD) and Meckel-Gruber syndrome (MKS) (Figure 2). All ciliopathies known so far show a recessive mode of inheritance, either autosomal or X-linked, with strong evidence of genetic modifiers that determine expressivity. Moreover, clinically distinguishable ciliopathies often result from mutations in a single gene (Table 1), suggesting complex genetic networks. Almost every organ in the body shows vulnerability in the ciliopathies. Most ciliopathies have overlapping clinical features in multiple organs. Cystic kidney and retinal defects are frequently observed. Skeletal dysplasia is predominantly seen in JATD, OFD1 and EVC. ALMS, Alström syndrome; BBS, Bardet-Biedl syndrome; CORS, cerebello-oculo-renal syndrome; EVC, Ellis-van Creveld syndrome; JATD, Jeune asphyxiating thoracic dystrophy; JBTS, Joubert syndrome; LCA, Leber congenital amaurosis; MKS, Meckel syndrome; NPHP, nephronophthisis; OFD1, oral-facial-digital syndrome type 1; PCD, primary ciliary dyskinesia; PKD, polycystic kidney disease. Disorders are described in the order of increasing phenotypic severity. Asterisks indicate genes causing allelic disorders. Semicolons indicate two different names of the same gene. RPGR, retinitis pigmentosa GTPase regulator. Although the disease-specific function of any single mutated gene in a particular ciliopathy has not yet been understood, the identification of several causative genes has contributed to a better understanding of the pathogenesis of the disorders and the biological functions of cilia over the past two decades. In the attempt to identify candidate genes, diverse high-throughput techniques have been applied, such as in silico comparative genomics, transcriptome analysis including analysis of X-box promoters, which are involved in the regulation of ciliary genes in Caenorhabditis elegans, and proteomics. These complementary approaches led to the identification of several new disease-causative ciliary genes and also propelled the ciliary biology field from basic science into the biomedical realm. Here, we summarize the clinical and genetic features of each ciliopathy disorder and outline the expanding range of a systems-biology approach applied to the study of ciliopathies. We also discuss advantages of the new genomic approaches and future strategies that will assist the transfer of research achievements into clinical practice. What are the roles of primary cilia and how were these roles missed for so long? The primary cilia that were evident from detailed electron microscopic studies over 40 years ago were initially considered to be evolutionary remnants without specific function. The first few genes identified from positional cloning of human and mouse disease genes did not point to the cilium as the site of their action. It was not until the accumulation of evidence suggesting the localization of the encoded proteins at or near the cilium that the importance of the primary cilium was realized, and the field of ciliopathies was born [3–5]. The simplistic idea that these genes were required merely for assembly of a cilium was rapidly usurped by observations of defective signaling in specific pathways at the cilium, most notably the Sonic hedgehog (Shh), canonical and non-canonical Wnt, and platelet derived growth factor (PDGF) pathways (Figure 3). There are probably a wealth of other yet unexplored pathways that are modulated by the primary cilium, which cells seem to use to concentrate signals or to help convey the spatial and temporal context in which to interpret extracellular signals. Various signaling pathways modulated by the primary cilium. (a) Platelet-derived growth factor (PDGF) signaling through PDGF receptor αα requires ciliary localization of the receptor to activate downstream targets mediated by the MAP kinase kinase (MEK)-extracellular signal-regulated kinase (ERK) pathway. (b) Canonical Wnt signaling through LRP5/6 and Frizzled (Fzd) is probably inhibited by the primary cilium, whereas the planar cell polarity (PCP) non-canonical pathway requires factors essential for ciliogenesis for activity, probably by mediating cellular polarity and polarized basal body localization, and is then activated by Dishevelled (Dvl) interacting with either Fzd or other PCP components. (c) Binding of Shh to patched 1 (Ptc1) activates Shh signaling by releasing inhibition of smoothened (Smo)-Gli-mediated downstream target gene transcription. 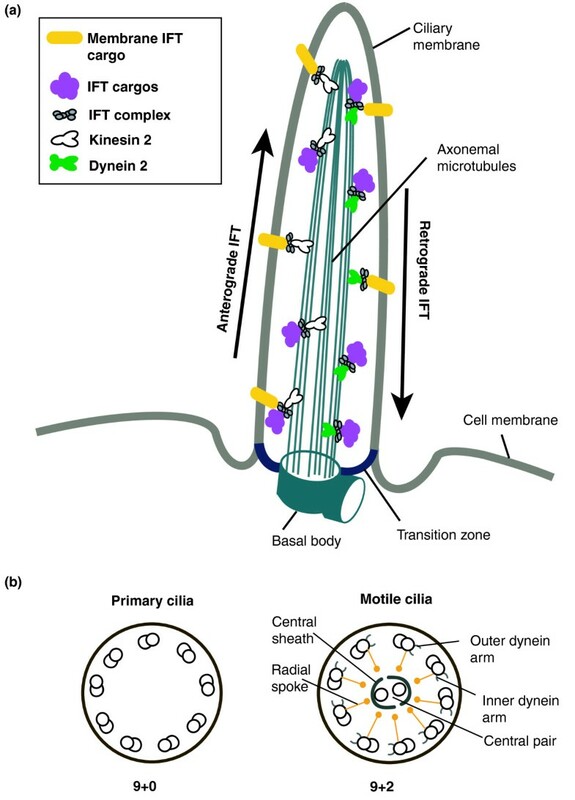 Formation of ciliary axonemal structures, such as the dynein arms, radial spokes, central pair of microtubules and central sheath, is necessary for regulating motility and beating of the cilia (Figure 1). Patients with primary ciliary dyskinesia or Kartagener syndrome (PCD/KS) can show ultrastructural axonemal defects in motile cilia . In addition, it is not surprising that many genes, such as DNAH5, DNAI1, DNAI2, DNAH1, KTU, RSPH9, RSPH4A and LRRC50, encoding proteins associated with ciliary axonemal architecture or entry of these factors into cilia, have been found to be mutated in PCD/KS [7–11]. Interestingly, a few genes mutated in the non-motile ciliopathies also seem to be linked with structural formation of the axoneme. For example, mutations of ARL13B in mouse Joubert syndrome (JBTS) and NPHP4 in C. elegans nephronophthisis (NPHP) give rise to ultra-structural defects of the ciliary axoneme, although the defects are relatively subtle [12, 13]. Patients with BBS have defects in the axoneme of spermatozoon flagella, which are closely related to cilia, and correspondingly Bbs2 knockout mice have abnormal spermatozoon flagellum formation . The connection between ciliary structure and function remains a central focus of the field. Using traditional approaches of human genetics, such as positional cloning, meiotic mapping, physical mapping and candidate-gene sequencing , PKD1 in PKD  and NPHP1 in NPHP  were identified as initial causative genes of ciliopathies in the late 1990s. Further diverse approaches, including promoter analysis, comparative genomics, transcriptome analysis and proteomics, have resulted in the identification of numerous ciliary-related genes and causative disease genes underlying ciliopathies [18, 19]. These new technologies gave new insights into understanding pathogenesis of the disorders and ciliary biology. Following the identification of many causative genes underlying specific classes of ciliopathies, it was observed that the proteins from a given class of ciliopathies tend to assemble with reproducible stoichiometry. This was first demonstrated for the complex of proteins encoded by genes mutated in BBS (called the BBSome), and has since extended to proteins from other ciliopathies, including those in the NPHP-JBTS-MKS complex [20, 21]. The core of each complex is made up of the proteins identified from humans with similar disease. For example, the BBSome is constituted by tight interactions between 7 of 12 BBS proteins. The NPHP-JBTS-MKS complex contains non-overlapping components, mostly proteins previously implicated in NPHP, JBTS and MKS, but also some unexpected proteins such as ATXN10 and TCTN2, both of which were subsequently found to be mutated in NPHP and JBTS, suggesting the likely relevance of the complex. The BBSome and the NPHP-JBTS-MKS complex are present in the ciliary region in the absence of ciliary disease. However, the function of these complexes in ciliary biology (and ciliary disease) is still not clear, although evidence suggests that the BBSome functions as a vesicular coat that transports membrane proteins to the cilia . There is mounting evidence that the NPHP-JBTS-MKS complex, with an estimated molecular weight between 0.7 and 2 MDa, functions at or near the transition zone of the primary cilia and regulates ciliary entry/localization of many proteins . It remains to be determined whether other multigenic ciliopathy disorders similarly display non-overlapping components and how such complexes function at or near the cilium. Thus, it is informative to consider these as disease-specific protein complexes, constituted by a host of non-redundant factors, each of which serves a still poorly defined function. Work in C. elegans suggests that the MKS and NPHP proteins establish basal body/transition zone membrane attachments coincident with IFT-dependent axoneme extension. In this light, it is perhaps not surprising that genetic evidence obtained by crossing mutants in C. elegans demonstrates more severe synthetic phenotypes (functional interactions) only when mutations occur in two different disease modules . For instance, the B9 domain proteins of the MKS module functionally interact with the NPHP module  but not with most other proteins in the MKS module. We can conclude that each protein complex probably forms an intricate modular network, as evidenced by specificity in the protein complexes and by functional redundancy. The ciliary biology field has greatly benefited from the tremendous gains in proteomics and genomics through the definition of the concept of the 'ciliome'. The ciliome consists almost completely of genes implicated in ciliary function, on the basis of a compilation of results from various studies involving human genetics, functional genetics and proteomics, and it is currently made up of more than 2,500 human orthologs. As expected, many of the genes subsequently identified as mutated in ciliopathies were already part of this compiled list, which has led to more efficient workflow by focusing on these genes. By applying next-generation sequencing (NGS) with a focus on the ciliome, new human disease genes have recently been identified in a relatively short time  and much larger groups of patients can be screened for existing genes, greatly aiding future genotype-phenotype correlations [26, 27]. The phenotypic variability often shown among ciliopathy patients carrying the same combinations of mutations has suggested the presence of modifier genes and/or the involvement of tri-allelic inheritance [28–32]. NGS potentially allows sequencing of an entire human genome in a few days and outputs thousands of new variants in candidate genes. In addition, a recent study, combining a massive number of in vivo experiments , has tested the possibility that new deleterious variants of known causative genes may function as modifiers in ciliopathies. NGS approaches are greatly broadening the sophistication and types of today's experiments in the ciliopathy field, as is occurring in other fields, using genome-wide approaches. 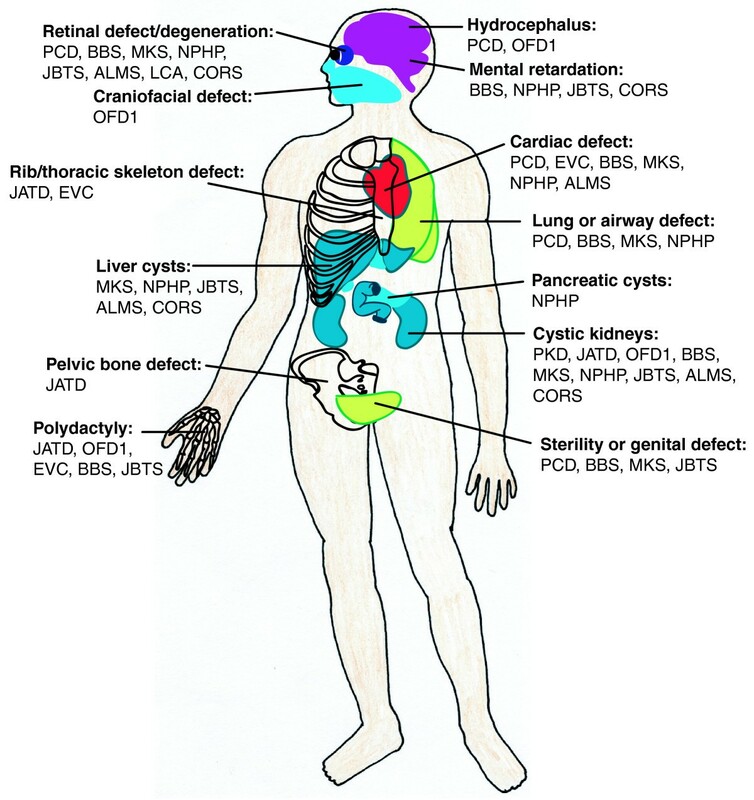 By targeting human families with key ciliopathy features, and applying either homozygosity mapping or whole exome sequencing approaches to identify causative genes, several diseases that were previously not considered as ciliopathies, such as Jeune syndrome , acrocallosal syndrome  and cranioectodermal dysplasia [35–37], are now considered to be in the extended ciliopathy spectrum. Interestingly, not all genes encoding centrosomal or pericentrosomal proteins cause ciliopathies, as the recent examples involving Seckel syndrome (primordial dwarfism) have shown [38, 39]. We thus conclude that there must be specificity of function in these centrosomal proteins, some functioning in cell cycle regulation or DNA repair and others in ciliary regulation, even if these functions are not as well delineated in non-human species . Cell-based screens using high-throughput functional analysis offer an exciting opportunity to identify key regulators of cellular structure and function. Application of genetic, chemical or even genome-wide small interfering RNA libraries to ciliated cells followed by assessment of signaling or ciliary structure provides an important complementary approach to understanding ciliary-specific genetic requirements [41–44]. These cellular analyses have uncovered many important signaling mechanisms, some of which are pharmacologically tractable and may serve as a basis for the development of future therapy, in particular because the assays can be targeted to bypass specific patient-related cellular defects. For instance, we found that positive regulators of actin polymerization functioned as negative regulators of ciliogenesis , and vice versa, prompting us to question whether actin destabilizers might promote ciliogenesis in cellular models of disease. We found that low dose application of the actin polymerization inhibitor cytochalasin D partially rescued cilum elongation defects caused by the hypomorphic mouse mutation Ift88 [41–44]. Further genomic screening focusing on a specific cellular process, such as ciliation linked to cell cycle regulation, post-translational modification of microtubules and regulation of ciliary transport and signaling, will lead to a greater understanding of ciliary structure/function relationships, their relevance to disease and potential treatments. The broad range of clinical features observed in ciliopathies leads us to ask how defects caused in a small cellular organelle give rise to such diverse clinical features in multiple organs. Identification and functional investigation of causative genes have always been emphasized and the recent accessibility of high-throughput NGS has propelled the ciliary biology field from basic science into the biomedical realm. The main challenge of NGS, however, lies in interpreting the massive amount of resulting data. The thousands of novel mutations found in every exome must be sorted by thorough filtering of the variants to determine which one is causative. Careful selection of patients with highly similar clinical features increases the likelihood of finding many different mutations in the same genes and the ability to distinguish pathogenic from benign variants. As ciliopathies are rare, complex, multi-symptom diseases, treatment to ameliorate the symptoms and provide better (prenatal) diagnosis will be more feasible than targeted therapies. For instance, kidney failure is the most widespread symptom among several ciliopathies. It therefore may be possible that candidate drugs used to treat kidney disease, such as polycystic kidney disease (PKD), can be used in ciliopathy patients to help alleviate kidney symptoms. With rapidly dropping costs of NGS and more sophisticated advances in bioinformatics, it may be possible to use genomics to stratify patients for optimal prescribing and/or treatment in the near future. Personalized medicine developed through comprehensive data obtained by complementary approaches may be the best hope for patients with ciliopathies. JEL would like to acknowledge funding support from American Heart Association (grant number 09POST2250641). JGG is an investigator with the Howard Hughes Medical Institute. The authors would like to thank Francis Lee for giving comments on the manuscript. JGG provided the overall direction and revised the manuscript. JEL drafted the initial manuscript and produced the figures and table.